If your team didn't make the playoffs I hope they at least got a good draft position. Shame about the Steelers getting neither, though they're likely to get a decent pick when they trade Antonio Brown. Patrick Mahomes is on fire. Forget about Andy Reid, none of his QBs have come close to the amazing season Mahomes has had. He had a high end Manning-Brady-Brees-Rodgers season. The next gen of QBs is among us, it's time to say goodbye to the OG unit of the NFL's Passing Era. From here on out it's all about Mahomes, Goff, Watson and whoever else pans out. The NFL is the new Arena League, so I expect records to fall, but as long as Mahomes is in the league at least one team will be fun to watch week-in, week-out. In case you can't tell my position on things, Mahomes is my clear cut 2018 MVP and, outside of Baker Mayfield breaking the rookie TD record and making Cleveland relatively legit again, Mahomes and the Chiefs are the story of the 2018 season. A nice time having two great young guys out there, making the playoffs in both their rookie years. Shoutout to Wink Martindale for throwing cover-zero blitzes at the Browns on 4 straight plays to end the game. That's a reference to Dean Pees going soft in the Bengals game, which cost the Ravens the playoffs (last year). Hats off to Wink Martindale for dialing that up. I'm confused. 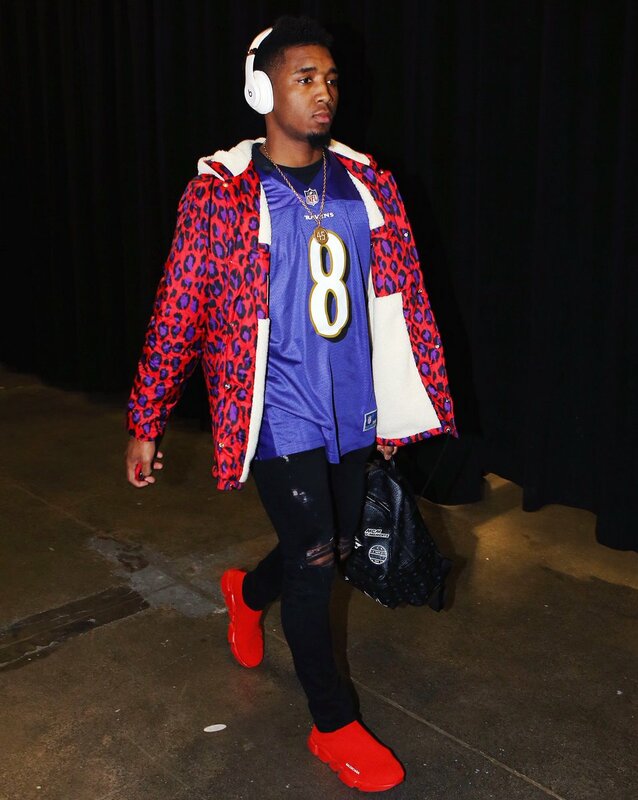 Aren't the Ravens IN the playoffs? Fixed. Yeah, they are, but they got booted from playoff contention last year on a 4th and forever after the DC called a bunch of prevent defenses. Nobody expects the Eagles to win in the playoffs.. The last time I didn't watch a Bears game for an entire season, they went to the Super Bowl. I'm hoping that they repeat that performance. If the Bears win the Super Bowl, Gruden has to get a ring, right? Josh McDaniels declined an interview offer from Cincy. One step closer to Hue. Is Marvin Lewis gone from Cincy? Hue Jackson being a potential head coach in Cincy is nothing more than the Rooney Rule and because Marvin Lewis was his friend. Nada else. All the rest of reports about him being a real contender is Hue leaking bullsh*t to the media. This is the same franchise that is also interviewing Vance Joseph (who would just as easily have satisfied that Rooney Rule requirement). I'm not ruling any Mike Brown decision out here yet. Wow. Andrew Luck and Drew Brees are the only top ten paid quarterbacks to be playing in this year's postseason. The Bears should at least send a gift basket to him this week. Matt Ryan seems the only one that is overpaid but there are a handful of great quarterbacks that are too far down the list. I know Brady is intentionally down the list but there are quite a few others that must be eating ramen. Uh, Derwin James is 1st and 2nd team. Jeez. What a season! Brady is overrated. Montana is the GOAT. My age puts me as an NFL fan who started noticing football Montana Chiefs and early Favre. What a lameass thread. His last post is "Brad's had good games, but I ignored all of those". Uh, yeah, let's ignore all the evidence and point out someone's flaws! 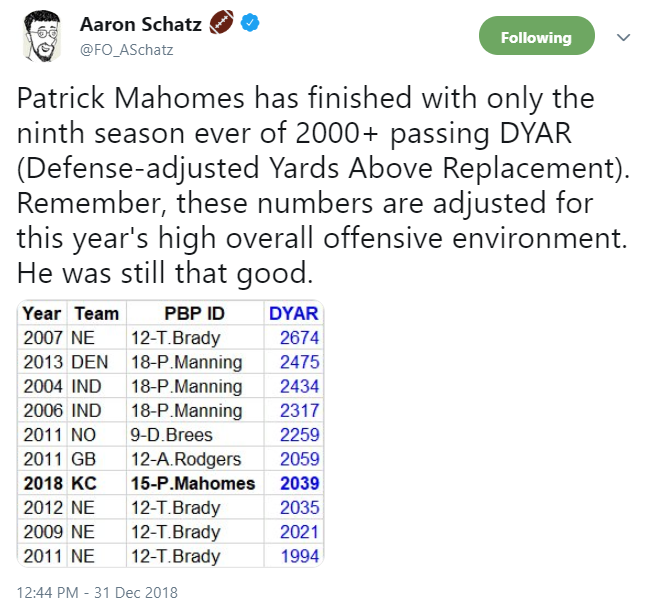 A better use of time would be finding all the magical moments Mahomes had this year. Way cooler! The greatness of Brady is in the Brady contract. The fact that he was an elite quarterback that didn't screw over his team by cratering their salary cap situation made him football historical. Joe Flacco and Matt Ryan demonstrate the exact opposite end of that spectrum. Re: All-Pro status. Good to see Bobby Wagner get recognized as 1st team. And the punter! For football today, am excited to watch the young Seahawks and Playoff Russell. I don't think I can take it losing to the Cowboys. Yeah, I dunno. Pointing out all of Brady's shortcomings from the 28 Super Bowls he has played in seems kinda dumb. No, Brady has never been a super passer in the Manning-Marino mold. But I'm not sure how you can overrate a guy with five SB rings and three NFL MVPs. Maybe he shouldn't have lost to the Eagles last season at age 64? Anyway, I'm thrilled for this weekend's WC games. I have no rooting interest (for or against), so I can strap in for two full days of very good football. It's the second best* football weekend of the year! * after only the divisional round; it's more about quantity than quality. As #1 Brady and Patriots hater that thread was awesome.. That guy wins the internet for 2019 and its only the 5th of Jan. I can’t stand Tom Brady. I haven’t read the thread. He is a wonderful QB. I can’t stand the Patriots. I haven’t read the thread. They are an awesome football team.